SIMPLETEC Hydraulic 40T Quench Presses is similar to the 25T Quench Press, but of higher capacity. Like the 25T machines, the hydraulically operated 40T Quench Press is a very fast and easy to operate. Except loading of components, all other operations are automatic. Loading of component from the furnace can be made automatic with the help of Pick & Place Manipulators. 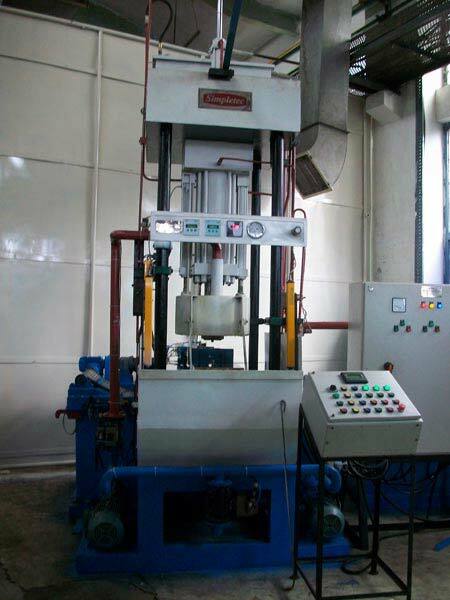 Secondary Quench System and quench oil Chilling Unit can also be supplied with the machine. System pressure and quench oil flow can be precisely set as required and can be seem on a HMI provided in the electric panel of the machine.